More than 20,000 people entered our Referral Program last month, giving us a lot of entries to go through and a lot of data to tally. 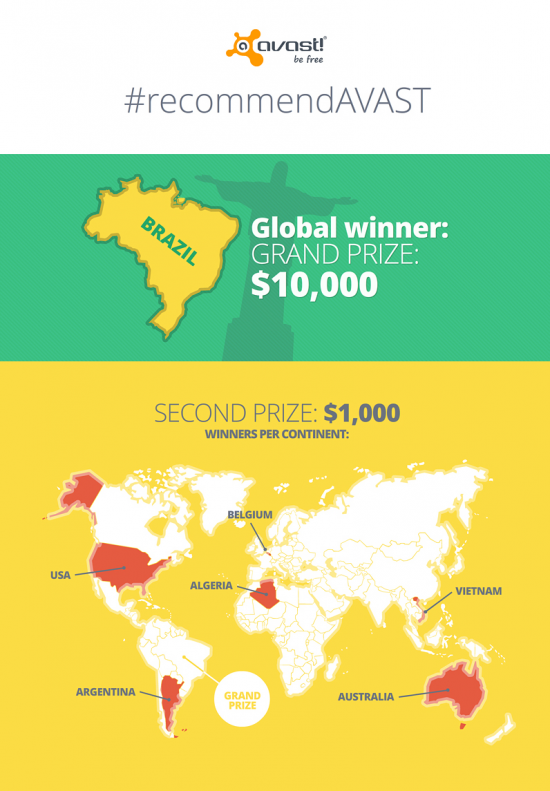 In the end, our grand prize winner came from Brazil, bringing in the largest share of the more than 145,000 new people who joined the AVAST community as a result of your efforts. We also had winners from Algeria, Argentina, Australia, Belgium, the U.S.A, and Vietnam. All of these winners have been notified by email, so please make sure that any messages from AVAST are not in your Junk, Spam, or Bulk mail folder. We created this infographic to show the impact of the program worldwide. As you can see there were a large number of participants, consequently we are still evaluating the creative entries. Part of the challenge involves translations of more than two dozen languages so that the judges can evaluate each entry fairly. We will be posting those winners as soon as we can. While the contest is over and the ruling of the judges is final, anybody can still win free Internet Security licenses for recommending AVAST to your friends. Remember that every time anybody joins the AVAST community, it helps all of us by increasing our network of malware sensors. Congratulations to all of the winners. We wish we could have declared everybody who entered a winner, but that’s not really practical. So we offer a hearty thank you to everybody who participated. AVAST is grateful for all of your support.